The wisdom of your soul is a pearl beyond any price. Every single learning and growth that you have experienced in every lifetime and between every lifetime has contributed to the brilliance, to the luminescence and beauty of the energy of your soul. It is hard if not impossible for human beings to even imagine a fraction of the brilliance of their soul and of who they truly are. And that has been part of the journey for humanity. Souls have been very much misunderstood in conventional religion terms but more and more people are coming to realise truly what they are now. They are your true self. They are always and eternal, they are on both sides of the perceived veil, although we have explained to you there is no such veil. The soul is the energy of love which is the energy of the divine, which is the energy of the oneness, the all that is, the isness we have mentioned before. The soul is all of these things and all of these things are the soul. The luminosity of the soul will illuminate your path on earth just as the beautiful moon across the water creates a path. You simply have to allow that illumination which is very simple and straightforward to do, and yet not many people know about it and those who do think it is difficult. Is it difficult to stand on the sea shore and look at the water with the path created by the moon? And how many of you have imagined walking that path? The reason that you imagine walking that path so often is because that is the truth of the potential that you can do when you connect with your soul. Your soul shines like the beautiful light of the moon and it is wanting you to become aware of it. It is aware of you, it encompasses you with its love. The soul can never be damaged, the soul can never be hurt, the soul can never be lost! There are so many inaccurate terms attributed to things that can happen to the soul. “Oh he or she is a lost soul”. No, they may be temporarily lost on their human journey but their soul is fine, thank you very much! You can connect with your soul by your intention. Everything is done by the power of your free will and intention. Your soul will assist you at any time. As we discussed in the previous chapter, spirit will always lend you its strength and your soul will always also lend you its strength because you are part of it. It would be as though your little finger was needing more blood and it asked for some more blood, please. The rest of your body would of course give it more blood, would it not? It wouldn’t say “You are separate from me so I’m not going to give you any of my blood”. That would be ridiculous. And so the power and strength and love and healing abilities are available to you at any time. The only potential hurdle between you and your soul is your mind beliefs about it. These mind beliefs are a result of education as you call it, society beliefs, religious beliefs etcetera. We don’t wish to be disrespectful at all but a lot of what many of you have been taught is junk and it simply gets in the way. And then you have what Hans* calls the “mind chatter” which chatters on and on, influence from the outside again, you see. To find the truth of this it is a case of listening to inside yourself, connecting with inside yourself and with spirit and with the divine. So the priority is to stop the mind chattering, release or at least put on the shelf the beliefs you have about the soul. That way you will find you will come to communion with your own soul which is a truly beautiful experience. It is beyond words, there are no words possible. It is the connection of you with you. It is the realisation of your own divinity. It is the immediate end of loneliness. It is the end of unworthiness. If you only glimpse a glimmer of the beauty of your own soul you will never be the same again. And this is why we draw the analogy of the pearl inside a shell. We chose that at the very beginning of our journey with Barbara. 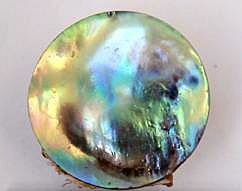 We impressed upon her the image of the luminous quality, the beauty and the way the light reflects from natural pearls. We chose this image for a number of reasons. One was, of course, it connected with our teachings about the shell that you put around your hearts and how, when the shell breaks, what is exposed is the beauty of the heart. So that image suited that teaching but it also suited this teaching. The luminosity, the effervescence, the utter divine perfection radiating love energy, love light, love power and love strength from the beginning to eternity, to all that is, was, ever will be is the luminosity of your soul. And it is utterly beautiful and it is who you truly are! We suggest that human beings seek to know their own souls. That would be the single most empowering teaching we could ever give. Get to know your own soul, allow the love and energy and power of your own soul in to illuminate your life. You may use some of the tricks and tip we have already explained to you, they will help with this exercise. This exercise of deeper connection with who you truly are. But another idea would be to simply envisage, as we have mentioned, the image of the beautiful, bright full moon casting a path of light upon the water. And it reaches directly to you, does it not? And you reach directly to it, of course. In your meditations or your dreams focus on this. And in your meditations and your dreams, of course, you can walk the path. You can walk the path, meet with and be enveloped by the love of your beautiful soul. Your soul, which is a beautiful pearl beyond price. Barbara Clark is the creator of the Beyond Affirmations: What Your Body Wants To Hear Meditation Series. A reading with Hans Christian King in August 2014 re-opened her channels of communication with spirit and led her to channelling verbally. Her first verbal channel was on the 12th October and spirit dictated the first chapter or illumination, as the spirit guides call them, of the forthcoming book, Brighter Horizons: Illumination from The Magdaleine Group on 11th November. No one was more surprised than she was! She has created a Facebook page for the book where she posts from the book and images inspired by the messages she receives. You can find it here. Barbara’s main website, Beyond Affirmations, is a great resource for information about how your emotions affect your health and what you can do about it. Meditations are available for download or you can get her mobile app and enjoy a free Relaxation and Well-being meditation. Barbara is also working on two new meditation series, Release & Transform to help release negative emotions such as blame, guilt, shame, anger, fear and jealousy, and a new What Your Body Wants To Hear series for serious dis-eases. If you’d like updates about the book and her ever expanding collection of healing meditations please send an email to join her mailing list. Just wanted to send you best wishes for your new work as a Channeler and to thank you for this pearl of wisdom, the first of many I have no doubt. I am still using the releasing skills I learnt from one of your guided meditations…..so helping me. Thank you again. Thank you so much for your kind comments. I truly appreciate them. I am so delighted you are still benefiting from the releasing skills. I feel so blessed to be a part of this lovely community too. Very beautiful and powerful offering, Barbara! Is the Magdaleine Group connected to the soul of the being who came forth as Mary Magdalene many centuries ago? It’s certainly about time she was truly seen! Thank you for your lovely comment, Susan. I am not 100% certain but I think they might be. I don’t get a lot of visions from spirit, I hear and feel more than see. But I had a vision of a woman in a long, dark blue robe with bare feet and she told me she walked on the earth in her bare feet. She also told me she is the “ring leader” of this group :)I am sure they have many more “illuminations” to share with me. I am VERY new at this channelling business :). I’ll let you know when I discover more. Thank you Kathy, for your lovely comment and for your artistic, techie and personal support. You are a star! A Pearl beyond price was so lovely to read. Thank you for sharing, Barbara Clark you have a beautiful gift of writing, as do John and Hans! Happy New Years 2015 to all, and the pearls of wisdom, the words of light and truth sing in my heart. Thanks very much, Karen, for your kind words! A most Happy New Year to you too! Thank you so much for your kind words Karen. I really appreciate them. Happy New Year wishes to you and yours. Thank you, Barbara! How wonderful about your upcoming book — and right on time! I know it has already activated so much potential— the shell has sprung open, the pearl is in sight! It glows before me and all through me, lighting my way. If I only can remember to pause, breathe deeply and Re-Member! (LOL!) These postings and all of your offerings certainly help! Love and many blessings to you, Barbara, and John, Hans, and all those seen and “unseen” who are gathered in communion at this point in “space-time” to assist humanity in our exciting, intense expansion and transformation! Thanks so much, Leslie, for your kind words. We certainly do have many “unseen” helpers with us as we expand in consciousness and love. Thank you! Thank you for your lovely comment. Being so new to channelling and putting my channelled work “out there” your kind comments, resonance with and recognition of the message touch me very deeply.